What fantasy story would be complete without a map? Since Sami is setting off on her voyage, the first order of business for me was to make a map so we can follow along! I’ll put this in its own tab at the top of the page so that it’s easy to find when you need to see where the action is taking us. 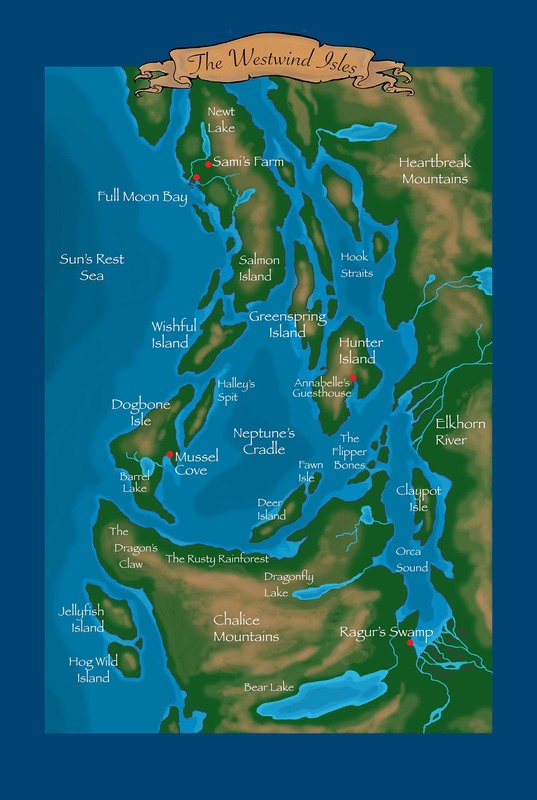 I had a lot of fun making up names — in fact, I had to restrain myself so that I didn’t name every little islet! There are actually a lot of little towns and villages scattered among the islands, but if I started naming them all, you wouldn’t be able to see the map. So I just stuck with places that will be relevant in the story (probably — we may not get to places like Bear Lake, in this story arc, anyway). Apart from the original sketch, I made this map entirely in Photoshop. I’m still quite a newbie at it, and every time I use it, I find something new to do with it. This time I figured out how to make my lettering do an arc shape. And I tried a new blending mode for the mountains layer. Hooray! Knowledge increases! And yes, I know I used Papyrus for a font; but I like it, so there. I may eventually do a handmade version of this, in which case it will be hand lettered. The actual story will resume on Friday, and I’ll be posting Mondays and Fridays, as I did for the first chapter. Stay tuned! This comic was posted in Maps and tagged comic, Fantasy Map, graphic novel, mermaid, mermaid comic, Photoshop, sailors, sea comic, webcomic, world-building.